Santa Barbara, California — Ultrarunner Jimmy Elam, who has just signed on as the newest member of the rabbitPRO team, is having what you might call a breakout season on the trails. Starting with a win at the Quad Rock 50 Miler in Fort Collins, Colorado in May, Elam has tallied up a total of three victories in just three months. June saw Elam travel to Lake Tahoe, California to contest the brutal 52 kilometer Broken Arrow Sky Race. Racing on his birthday, Elam covered the distance, which included over 10,000 feet of climbing, 10 minutes faster than his nearest competitor, snagging the win and a securing a nice present for himself in the form of a $5000 prize for first place. 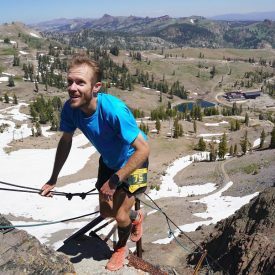 Less than a month later, Elam traveled to Idaho to compete in the Beaverhead Endurance Run 100 kilometer race. There, Elam took home not only the victory but also the course record, besting the previous mark by over 10 minutes. For Elam, the successful summer is the culmination of a passion that he has nurtured since his childhood. “Growing up, both of my parents were runners and I really looked up to them and what they did, which naturally transitioned into myself being a runner. Early on in life I competed in the USATF youth track and XC competitions around the country.” Elam gives major credit for his development as a runner to his college coach at Chico State University, Gary Towne, who he says “helped myself and countless other athletes reach their full potential. We all looked up to him more than anyone and truly believed in his training methods.” Under Towne’s tutelage, Elam achieve one of his lifetime goals by becoming an NCAA All-American at 10,000 meters. Even more than any title, victory or prize purse, though, Elam values running for the community that surrounds the sport and for the friends that it has brought into his life. “I’ve met so many amazing people through running, and I’m a believer that the bonds you form with others while training and racing are incomparable to anything else.” Indeed, it was one of these friends, former Chico teammate and fellow rabbitPRO Anthony Costales, who introduced Elam to rabbit and suggested he pursue a relationship with the company.